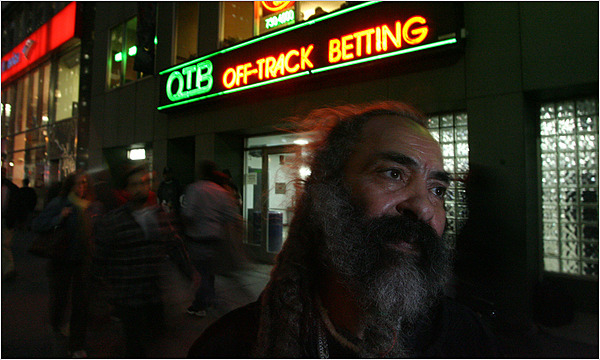 In 1999, Jesus Leonardo placed a bet at an OTB window in Manhattan, when the race was over he had lost and threw the ticket on the floor in disgust. But then, all of a sudden there was announced that there was an inquiry and soon the results were changed; now he was a winner, $900 to be exact. Alas, he’d already tossed the ticket into the garbage, and after fruitlessly searching for it, couldn’t find the winning ticket. Despite tearfully pleading with the manager, Leonardo was told there was nothing that could be done. However, the manager suggested that if he wanted to take the trash home and look through it, he was welcome to do so. On average Leonardo makes anywhere from $100 – $300 a day, feeding ticket after ticket into the scanners looking for winners. With the help of some friends, he has branched his operations out, getting the garbage from 5 OTB locations which he then digs through on the lookout for lost treasure. Leonardo says that he makes on average over $45,000 a year, which he pays taxes on. Back in 2006 he had his best single ticket finding a Pick 4 that someone had tossed worth $9,500, not too shabby. According to the New York State Racing and Wagering Board nearly $8.5 million in racing bets go unclaimed each year, meaning that Leonardo is only getting a small slice of the larger pie.